On 500th anniversary of Antonio De Ferrariis's death, last March the community wanted to honour him by dedicating a memorial plaque on the external wall of Municipality (Via Convento,Galatone) and inaugurating "The Galateano Year". 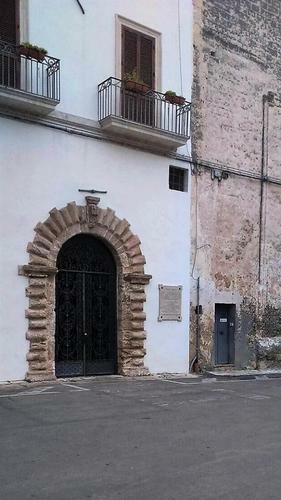 The plaque is very interesting because of its content. 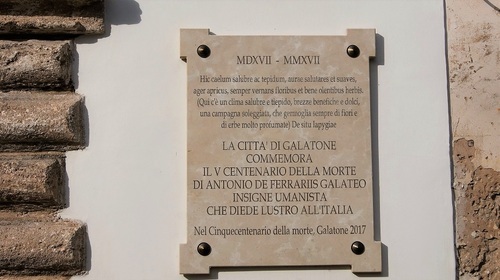 "LA CITTA' DI GALATONE / COMMEMORA / IL V CENTENARIO DELLA MORTE / DI ANTONIO DE FERRARIIS GALATEO / INSIGNE UMANISTA / CHE DIEDE LUSTRO ALL'ITALIA / — / NEL CINQUECENTENARIO DELLA MORTE, GALATONE 2017".